This introductory course in HR Management provides a broad overview of the HR function. It is designed to help front-line managers, supervisors, and junior level HR staff effectively handle issues related to performance management, recruiting, retention, compensation, and the latest updates in labor laws, such as FLSA, FMLA, and more. 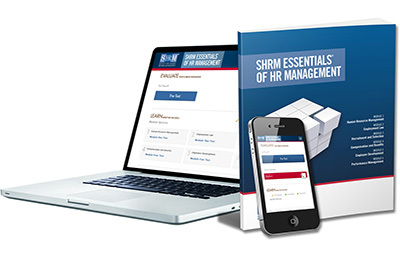 Those who complete this course receive a Certificate of Human Resource Management from SHRM. Who can benefit from the SHRM Essentials of HR Management course? -New and junior HR practitioners who need to increase their knowledge base -Small business owners or office managers who perform the HR function for their company and business managers who want to learn basic HR best practices to avoid costly litigation -New or experienced managers interested in learning more about employee management skills -Representatives selling or supporting HR systems and services -International HR personnel wishing to increase their knowledge of U.S. HR practices Tuition includes the cost of materials.